What are the Pros and Cons of Buying a Home in the Winter? Many b uyers wonder whether they should consider buying a house in the winter. After all, there’s usually a lot going on at this time, especially toward the end of the year. However, it’s important to keep in mind that while the winter months might not be the busiest time of the year for buying real estate, it can offer some excellent advantages. Many sellers choose to wait until the weather warms up a bit in order to put their home on the market. There can be several reasons for this, including more buyer interest as well as the ability to better show their home at its best. However, for a buyer, buying a house in the winter might mean there is less inventory from which to choose, but it can also mean that the seller might be more motivated to close the deal. This can mean more negotiating power for the buyer and fewer competing offers. Of course, with less housing options, a buyer might need to be a bit more flexible when it comes to their specific housing demands. Are There Better Moving Prices in the Winter? Another benefit of moving during the winter is that you’ll often find excellent deals from moving companies and other service providers. Just like the real estate market is often a bit slower during the colder months, so are service-related industries, such as lending institutions, inspections, closing companies, title companies, and even moving companies. For the home buyer, this can mean the process can often move along with fewer delays. Can Property Concerns Become Hidden by Snow and Ice? While many sellers worry about the hassle of trying to attract qualified buyers during the winter, this time of the year can also present some challenges for the buyer. When the weather is nice, it’s certainly easier to get a better perspective on the condition of the property, including any potential problems. 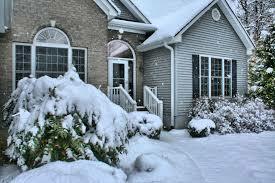 Therefore, if the property is covered in snow, it can be difficult to truly assess the full extent of the property. This shouldn’t deter a buyer from purchasing during the colder months, but it should be an area of concern that should motivate them to look a little deeper into any potential risks or areas of concern. Is Winter Moving Inconvenient or Efficient? Every buyer is unique, but one common complaint about moving during the winter is that it’s not only more inconvenient, but it also means disrupting family life at a time when many people are concentrating on enjoying the holidays. Fortunately, with the winter season offering less competition, you might be surprised that you can get into your new house with minimal time, fuss, and disruption. This will allow everyone time to get settled and feel comfortable in their new surroundings before the weather warms up and other interests take over. What Are the Financial Benefits of Purchasing a Home in the Winter? The end of the year is also an important time for financial reasons. A seller might want to close during the winter so they can purchase another home. Likewise, a buyer might want to take advantage of any tax benefits. Purchasing a house before the end of the year will typically mean that you’ll have some tax advantages that can be used in filing your taxes for that year. If you’re looking for the best tax strategies, be sure to consult with your accountant or tax advisor. If you’re thinking about buying or listing a home this winter, contact our office today! We are also happy to discuss the best time of year to buy or sell based on your needs.